Product prices and availability are accurate as of 2019-04-20 20:58:51 EDT and are subject to change. Any price and availability information displayed on http://www.amazon.com/ at the time of purchase will apply to the purchase of this product. 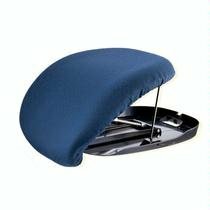 UPEASY Seat Assist is a mechanical lifting cushion that will ease you into your seat, as well as help you up. Its lifting action releases gently as you begin to stand - lifting up to 80% of your body weight, as needed. Seat Assist require no electricity to operate, and so is convenient to take everywhere you go. Portable: No electricity required. Take it wherever you go. Adaptable: Fits most armchairs and sofas. 1. The flexible seat curves to a flat surface that lifts you up on a level plane. This patented LeveLiftT design provides for a safe lift up, with no forward dumping motion. Patent # 5,316,370, The injection-molded base is made of durable polycarbonate, and covered with a non-slip material that prevents shifting on fabric seating surfaces. 2. The marine blue fabric cover is made of 100% polyester and is machine washable in cold water. The foam cushion has a water resistant coating that can be wiped down with mild soap and water. 3. Weight setting grooves provide easy adjustment for users of varying weights. Choose Model UPE 1 if you weigh 95-220lb (43-100kg) or Model UPE 3 if you weigh 200-340lb (91-154kg). A hydro-pneumatic gas spring serves as the lifting mechanism, releasing automatically when you begin to stand. No battery or electricity required. 4. When the lifting mechanism is disengaged, the cushion folds flat for easy transport. The built-in handle on the base makes it easy to carry UPEASY Seat Assist anywhere. To get up you simple lean forward to stand and the lifting mechanism automatically releases to provide assistance - lifting as needed, up to 80% of your body weight. 5. In the market place for mobility equipment, UPEASY Seat Assist is unique, offering ultimate convenience and total portability. If you currently own a seat lift chair, Seat Assist can serve as a valuable aid to your independence in other rooms of your home, or when you go out and about.